After a foggy start in Port Augusta (and a $5 load of laundry!!) we were on the road to the Barossa Valley for a few days before the final trek home. 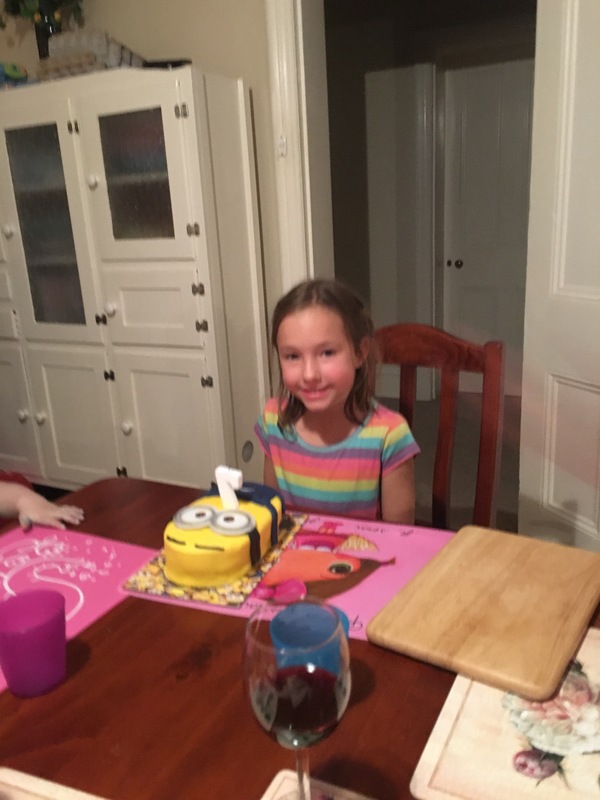 Miss6 would be turning 7 while we were in the Barossa and it felt good to know that we wouldn’t be spending the day driving for hours in the car. It also meant that I had to encourage the kids to play at the playground together while I grabbed a few groceries at the supermarket (plus birthday card, gift bag and a little toy for the big day). 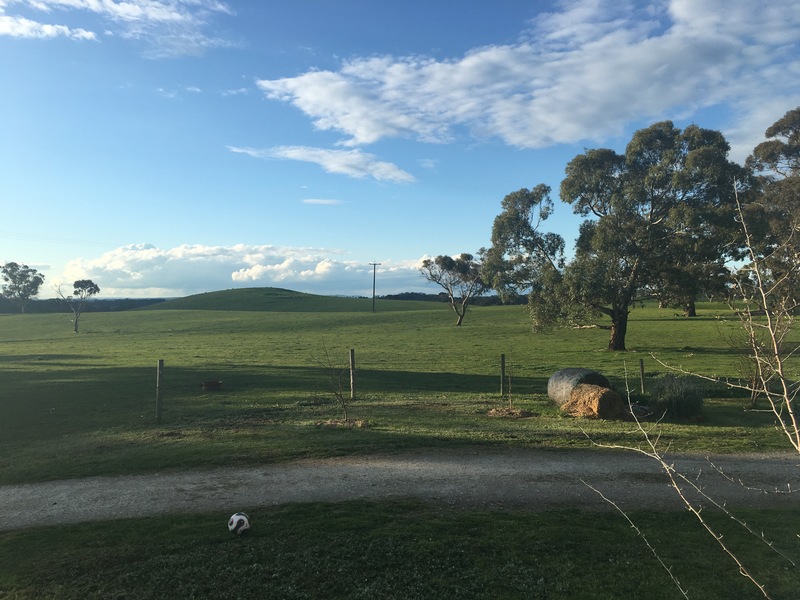 We got to the Barossa in the afternoon, lucky enough to have made some lovely friends three months earlier who had a 1,000 acre sheep farm that we were going to camp on. Miss6 quickly raced off to play with their little girl while Master14 and I set up the camper before spending the afternoon and evening hanging out with our friends in front of the fire. The five days straight driving must have had more of an impact on me than I’d thought – with no alarm I managed to sleep until 9am. Miss6 joined our hosts for a lovely long walk across the farm while I relaxed and got breakfast sorted. Our friends had very young children who still had daytime naps so once the kids were in bed, we headed out for the afternoon to see some of the sights. We ended up at Maggie Beers Farm to watch one of the free cooking demonstrations in her former TV studio kitchen. 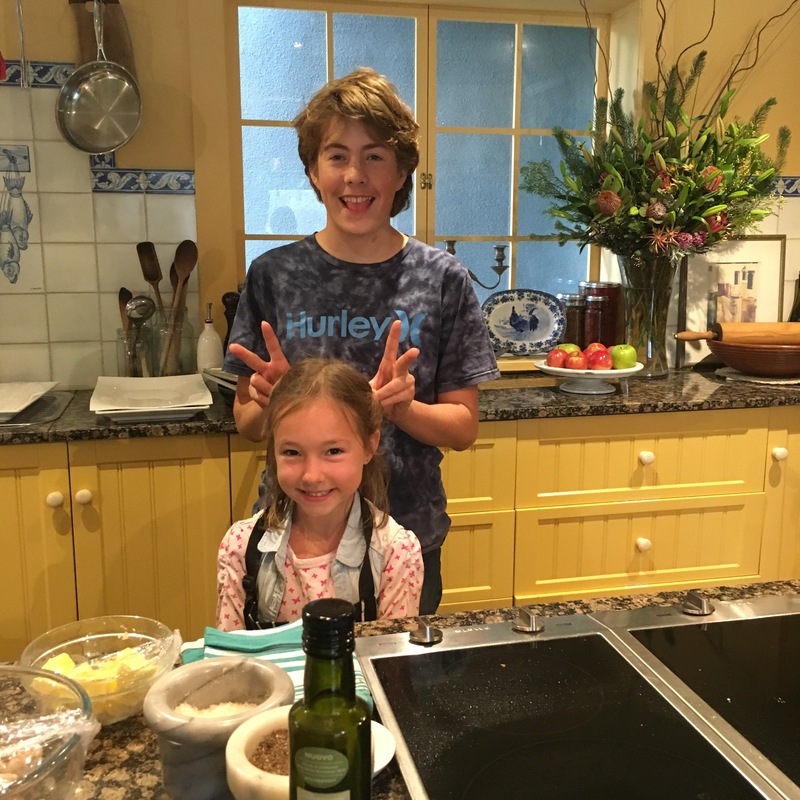 The hearty roast vegetables that they made were delicious and the kids even tried some of the veggies they didn’t normally like – luckily they had the recipe there for us to take home! After dressing up in Maggie’s apron and posing for some kitchen photos, we enjoyed some afternoon tea while and lots of taste testing in the farm shop. We’d heard about Whistler Winery where they had a Kangaroo sanctuary so headed there for the afternoon. I did the obligatory wine tasting and ended up buying a bottle that I liked as it’s not available in Melbourne (a perfectly legitimate reason for buying yet another bottle of wine) while the kids played outside doing their treasure hunt. The kids and I then went and patted some of the kangaroos, treating them to a couple of almonds – one of their favourite treats. Miss6 is really loving the idea of being a wildlife rescue worker when we get back – she’s even asked for a farm for her birthday! On the way back to the farm we stopped in at Nuriootpa to try the hot chips and gravy at the Chicken Centre – we’d been told they were the best chips you could buy and they weren’t wrong! I later found out that Kamiel even makes his own chicken salt – the kids and I thought they were delicious and a great entree for a dinner of leftovers. After dinner we joined our friends again so the kids could play in the loungeroom – this is the most indoor space the kids have had in months and they’re loving it. Tomorrow is Miss6’s birthday and we’ve been invited to join our friends for a roast dinner. I think the excitement was getting too much for Miss6 as she stayed awake for ages talking to herself in bed while I sat freezing at the kitchen table trying to secretly wrap a few things, write in her birthday card and blow up birthday balloons. We woke in the morning to a very excited little girl and a van full of pink happy birthday balloons and a hot chocolate date with our friends at a local cafe. After morning tea I’d planned to take the now Miss7 to the local gem shop for some fossicking but they weren’t doing that activity at the moment so she just got to check out some of the gems and window shop in another kids boutique clothing store before we headed back to the cafe for lunch instead. 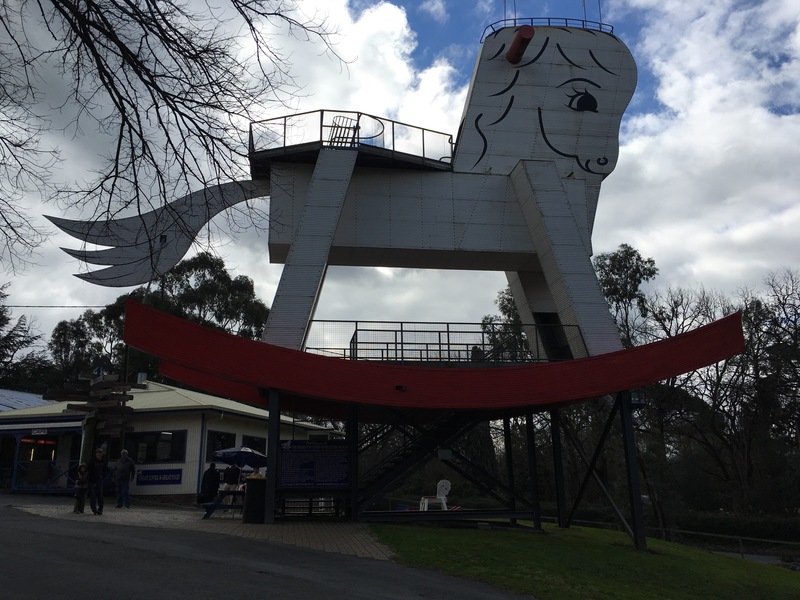 Our friends then went back home for naps while I took the kids to the world’s largest rocking horse for a look around. The neighbouring toy shop had some amazing wooden toys available and Master14 bought himself a wooden puzzle cube after our hike to the top of the rocking horse (I’m yet to master the puzzle though he’s mastered it a few times already). We then took a walk through their animal sanctuary with a small bag of food to give to the goats, alpacas, ducks and kangaroos – one of the alpacas decided to have a little nibble on Miss7’s arm but the tears soon subsided when a couple of little roos joined us for a feed. We finished the day off with a yummy roast, happy birthday singing around a birthday cake and an evening with our friends and generous hosts. I’d been worried how Miss7 would go having her birthday away from home and her Dad but she had a great day and is smitten with her little friends and their family. 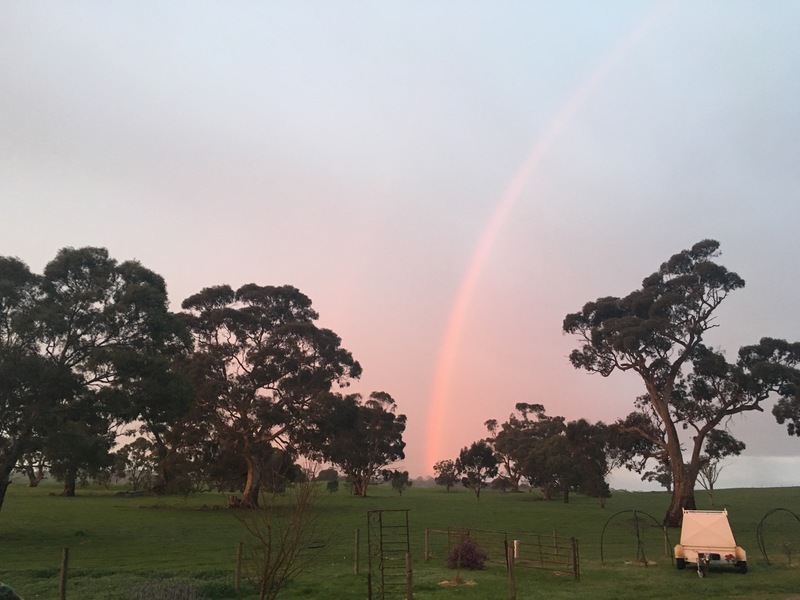 It’s been a lovely few days in the Barossa with its lush green pastures and meandering vineyards and the views from our camper on the farm have been a beautiful last adventure for our trip.